If you have a girlfriend/wife/female partner, once every 28 days or so her uterus stages a revolt against her inside of her body. I’ve had my girlfriend explain to me what period cramps feel like, and it sounds like hell. The best way that I could summarize her description of her period (for my male readers that have never experienced the sheer joy of period cramps) would be that it’s like it’s a three-way mash-up between the stitch that you get in your side when you run for a long time without breathing deeply enough, bad indigestion, and gently getting punched in the balls… except that it happens repeatedly, throughout the day. So EXCUSE WOMEN for complaining about the terrible pain in their bodies once a month. Her uterus is starting a bar room brawl in her torso, and so she might be understandably grumpy for a few days. Period cramps, for most women, are generally the worst within the first day or two of their periods, and the following seven tips are mostly aimed at those first couple of days. So instead of running for the hills and leaving her to do her own thing (unless she has explicitly told you to leave her alone during her period, and she means it) why not step up and earn the Super Partner of the Year award? Here are seven ways to be an awesome partner to someone who is getting their period and is going through agony. I know that not all of my readers are self-employed, but a large enough percentage of them are, so I’m going to start with this point right off the bat. If you can shift your work schedule so that you have the first two days of her period off, then you’ll be rocking official superstar status in her books by being there for her. Obviously this point works better if your significant other is relatively regular with when she gets her periods. You get to spend time together, you get to be there for her when she’s in pain and lessen her suffering, and you get a few bonus days off from work. Win-win. I know a lot of women who get unique cravings when they first get their periods. You can either ask her in advance what she wants to have on hand to mow down on, you can ask her on the day, or you can just have her favourite snacks and drinks on standby. Not sure what to get for her? Here are two delicious and practical places to start. Dark chocolate (make sure that it’s at least 80% cacao) aids blood flow, sleep quality, and mood. And cinnamon has anti-inflammatory and antispasmodic properties that ease the severity of her cramping. So both of these foods are good to consume during her period, especially in the first day or two. Last but not least, curcumin (aka the active ingredient in turmeric) is a great supplement to take while experiencing period cramps. Curcumin is a natural anti-inflammatory and is good for the overall maintenance of health. I mean, period or no period, who would ever turn down a big plate of dark chocolate and cinnamon toast? 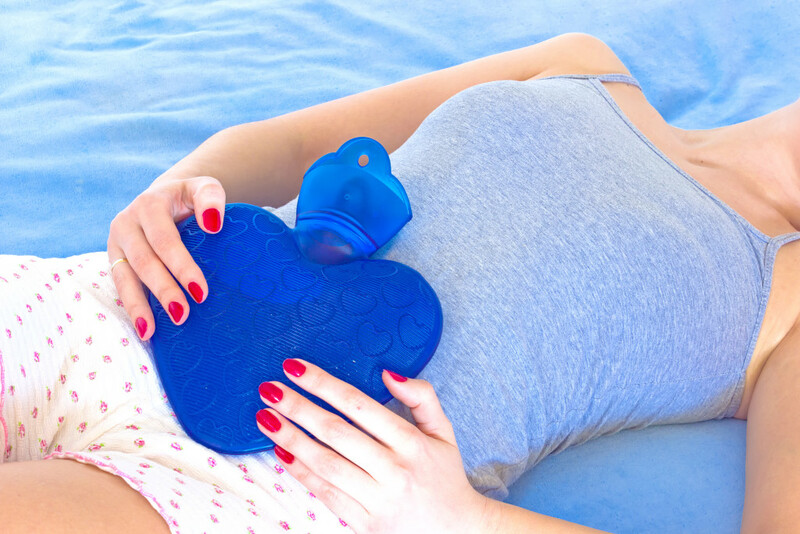 If your partner gets particularly bad cramps or lower back pain during her period it can feel soothing to have a hot water bottle resting against her most painful areas. Have one on hand just in case it helps her rest easier. Giving your partner a massage is a nice way for you and her to connect on any normal day, but it can be double-y appreciated if the strength of your talented hands distracts her from the war going on inside of her body. Not sure where to start? Break out the coconut oil (or massage oil) and ask her what she would like, or give her a foot massage, hand massage, or lower back rub. Staying hydrated is important for everyone all the time for tons of health reasons, but it’s extra important for women to stay hydrated during their periods. According to science, increasing hydration equals reduced severity of cramps. Just like your magical hands massaging her will distract her from her period pain (somewhat), so too will the magic of television/movies! Have her favourite thing to watch ready to go. Whether that means renting ‘Titanic’ from iTunes, or grabbing the four-season box set of The O.C., have it ready to go and you might just be her hero. Does she want you to watch movies with her and cuddle her all day? Or would she rather have her own space for the majority of the day? Your overarching mindset for this entire time of the month… be flexible, be attentive, and be there for her. Advil? Boom. It’s in your bathroom cupboard. Extra tampons? There’s a pharmacy down the street. Go grab them for her (make sure you ask what specific brand and size she requires – it matters). She needs to cry about something even though she doesn’t understand why she’s crying? Be there to hold her through it. You know your partner better than anyone else. If you can’t figure out what she needs, you can ask her. As always, be the best partner you can be and do it because you love her. Ps. Looking for unique ways to be the ultimate romantic partner? Check out my books 50 Powerful Romantic Gestures, 50 Powerful Date Ideas, and Keep Her Captivated: Lead Your Relationship To Its Maximum Potential by checking out my books page.